Maja had moved to the little island with her family not long ago. She missed home terribly and wanted nothing more than to go back. Soon after, she finds a friend and wishes things would never change. But when her friend moves away, her world crumbles once more. One day, Maja hears a friendly voice speak to her and a new friendship begins to form. With time, Maja discovers that distances do not matter; the friendship and love she finds in others will stay with her always, and goodbyes are not forever. 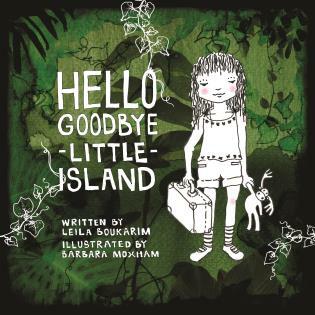 Hello Goodbye Little Island is a story about the difficulties of relocation, saying goodbye and learning to form new and meaningful relationships. Beautiful illustrations with a mix of different mediums and photographs will enthral readers of all ages. A “look-and-find” activity on every page will also engage readers and help them discover more about the little island. Leila Boukarim was born in Lebanon and raised in several countries. She now resides in Singapore with her husband and two wonderful children. Since discovering that her firstborn is a highly sensitive child, Leila has dedicated herself to shedding light on what it is like to have a child who does not enjoy the playground, sprinklers or parties, and to writing books that speak to these extraordinary children. Her self-published books, All Too Much for Oliver and Aiden Finds a Way, have been recommended by Dr Elaine Aron, the thought leader and research psychologist who coined the term “highly sensitive”. About the Illustrator Barbara Moxham was born in Munich and raised in Sydney. of Design in Visual Communications and a Master of Art in Painting and Drawing, she worked as an art director and graphic designer. Her incurable book addiction and becoming a mum lead her to picture book illustration. She has illustrated two books for highly sensitive children and hopes to help all children realise that being uniquely different is actually super cool.